17-Apr-2009 -- This report is the third out of a series of four confluence visits. The story starts from 31N 36E. We spend the last day of our one-week vacation in Jordan in the oasis Azraq. In its vicinity, there are various historical desert castles from the Omayades (6th century) that can be visited. In the morning we left Azraq at 8:30 a.m. towards the road to Ṣafāwiyy that links Jordan with its neighbour country Iraq. After we had driven half an hour, we had minimised the beeline distance from originally 23 km down to 3.9 km. This is how close you can get by road. We parked our tiny Chevrolet on a small side road that runs parallel to the main traffic route. As usual, I opted for my light-weight running approach, i.e. taking only the minimum required equipments with me: GPS and camera. However, this time there was no way I could run. The area is densely covered with black volcanic rocks. That's why the desert is called 'basalt desert'. In order to get forward I had to jump from one rock to another or alternatively find a spot for my feet between these rocks. But since I was not in a hurry, I took my time and reached the CP after about one hour without breaking my ankle. I found two cairns at the Confluence, probably build by previous visitors. Interestingly, there must have been heavy rains the days before – a rare event – and the CP area was wet and muddy. 50 m east of the Confluence has accumulated a lake where yellow flowers have started to grow between the basaltic rocks. The lake can be noticed with Google Earth. My way back was slightly quicker, because I could partially follow a track that meant a deviation, but allowed for running fast. We drove back to `Ammān where we visited the fourth and last confluence of our trip to Jordan. Time at the CP: 9:39 a.m.
Vegetation: none but the yellow flowers 50 m south to the Confluence. 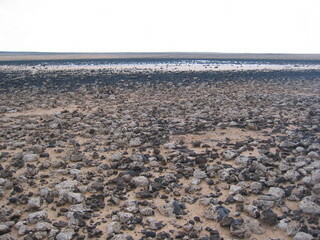 Description of the CP: Located in the north-central part of Jordan, 23 km north-east of Azraq along the al-Šimāliyy road in the basalt desert. Story continues at 32N 37E.